As the world could see in the fiat of Blessed John Paul II the greatness of the fiat of the heart of St. Joseph (Mother Adela, I HAVE FOUND THE HEART I WAS SEARCHING FOR) so we must be living witnesses to the virginal fiat we are called to give each day and each moment of our lives as priests and seminarians. Joseph is the spouse of Mary, who is a living image of the Church. We learn from St. Joseph how to love the Church as our bride in a pure, simple, masculine and virginal way. His mission as the custodian of Mary and Jesus, the Two Hearts- the greatest treasures of the Church who are also the Church, is entrusted to the priests and seminarians today. This Josephite mission is a sublime gift that requires a radical self-offering in love. In St. Joseph, a priest can see man’s potential to love to the extreme in the simplicity of daily life as a virginal spouse. We are called to live-in the grace of virginity, to be virgins and to love as a spouse of the Church. Our identity as a spouse of the Church forms the way we love and the way we love gives shape and form to who we are, our personality you could say. The priesthood (and therefore also that of the life of a seminarian) then is a Josephite mission and requires love that is spousal and paternal. Your self-identity as a seminarian cannot be a bachelor, a single man, or a college student…absolutely not! your self-identity as a seminarian is a man in formation to be a priest and the mission of the priest; while not being fully lived yet, it must be your identity. To be a seminarian is your identity and a seminarian is a man who is being shaped and formed to be a living image of the priesthood of Jesus Christ. As seminarians and priests, St. Joseph helps to teach us how to live such a supernatural calling. Joseph teaches us how to love Jesus through Mary as Joseph lived “all for the heart of Jesus through the heart of Mary.” His spousal love for Mary formed his personal identity and as the virginal spouse of Mary he lived as the virginal father of Jesus. When he looked at Mary he saw the Mother of God but he also saw his wife, the dearest treasure of his heart, the one who drew-out of him a greater self-giving in love through her divine Maternity. Mary’s maternity drew-out of the heart of St. Joseph a higher level of love: spousal and paternal; a greater self-donation to the service of God. St. Joseph is an example for us of a male heart totally consecrated to God, to the service of God in radical availability, purity, obedience, poverty, and humility. In St. Joseph we discover so much of who we are and who we are called to be as seminarians and priests. It is not just simply a devotion but a whole school and formation of our masculinity identity as men called to live-in the grace of virginity as spouses and fathers, custodians of the greatest treasures, the Church and the Eucharist. Mary is the Church – as Cardinal Ratzinger wrote in his book: Daughter Zion. Mary is the Church and Jesus is the Eucharist. A priest is a custodian of the Church and the Eucharist as St. Joseph was the custodian of Mary and Jesus. We are custodians of the Church as spouses of the Church as St. Joseph was the custodian of Mary as her husband and she his wife. This spiritual truth must form the deepest aspects of our self-identity and personality. You are not bachelors or single men. You are engaged, if you want an analogy, and must live-in the grace of your call to be a virgin-spouse of the Church, now. So much priestly formation never takes place in the hearts of seminarians and priests because they have the self-identity of a single man or college student or bachelor. These self-identities are not compatible with the priesthood and therefore a seminarian. The mission of St. Joseph as a husband and father deeply shaped his identity and personality and it can only shape your personality after it has taken root as your identity. You are not single men, you are seminarians, and as such you are to be living as betrothed, spoken for, engaged, called to live as St. Joseph, to be living images of Jesus Christ and custodians of the beauty, purity, maternity, and sanctity of the Church. Mother Adela also asks the rhetorical question in AT THE SCHOOL OF MARY’S HEART: WITH A ROSARY IN THEIR HANDS: “Was not Nazareth the Home and the School of the Priestly Heart of Jesus?” The seminary was described by Pope Benedict XVI at world youth day in Cologne as a time of Nazareth. St. Joseph was the father and guardian and primary formator, we could say, of the humanity of Christ, of the priestly heart of Jesus, and so St. Joseph by his life and example must form us. It is not a simple devotion. It is a school and formation in the truth of who we are as men, as seminarians and priests called to live as a virgin-spouse, custodian of the treasures of the Church and the Eucharist. Saint Joseph is a call to each of us to a life of integrity, virtue, and authenticity. He shows us the truth of who we are. The spouse of Mary, by his example of chaste spousal love and radical obedience to God, calls each of us to repentance and conversion. To repent from selfishness, pride, vanity, living for ourselves, immaturity…to repent from and renounce a way of living and thinking that has come from the world and may be demonic; to a radical repentance and conversion of life to the plan of God. We cannot simply pray the novena to St. Joseph but in this novena we have to be changed by the example of St. Joseph; to discover more deeply who we are and to allow who we are to form our identity, personality and affectivity. The truth of man, especially the truth of who a seminarian and priest is, is seen in the example and mission of the great saint, the custodian of the Church, the custodian of the Two Hearts. St. Joseph, Father and guardian of the Holy Family, pray for us! St. Joseph, Guardian of the Church, pray for us! St. Joseph, virgin spouse of Mary, pray for us! St. Joseph, model of priestly love, pray for us! St. Joseph, example of work and sacrifice, pray for us! St. Joseph, formator of the priestly heart of Jesus, pray for us! St. Joseph, formator of the priestly heart of priests and seminarians, pray for us! St. Joseph, virgin, spouse, father, provider, and custodian, pray for us! St. Joseph, pure, jut, humble, obedient, meek, hardworking, prayerful and courageous, pray for us! St. Joseph, heart so full of love for your spouse, pray for us! St. Joseph, heart so full of love for Jesus, pray for us! St. Joseph, heart so pure and consecrated to the service of God, pray for us! St. Joseph, third heart and custodian of the Hearts of Jesus and Mary, pray for us! St. Joseph, model of masculinity and spousal love, pray for us! St. Joseph, model of purity and self-sacrifice, pray for us! St. Joseph, terror of demons and refuge of the tempted, pray for us! St. Joseph, custodian of Love incarnate, pray for us! 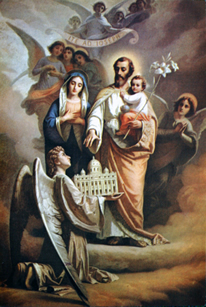 St. Joseph, custodian of purity, pray for us! St. Joseph, custodian of the feminine genius, pray for us! St. Joseph, custodian of the Mother of God, pray for us! St. Joseph, Custodian of the New Evangelization, pray for us! St. Joseph, faithful husband of Mary, pray for us! St. Joseph, faithful father and protector of the Child Jesus, pray for us! St. Joseph, faithful descendant of David, pray for us! St. Joseph, example for priests and seminarians, pray for us! St. Joseph, witness to the truth of man, pray for us! St. Joseph, witness of live and love, pray for us! St. Joseph, witness to the civilization of Love, truth and life, pray for us! St. Joseph, our father, brother, teacher, guide, and friend, pray for us! St. Joseph, teacher of how to live, “All for the heart of Jesus, through the heart of Mary,” Pray for us! St. Joseph, heart of Gold, pray for us! St. Joseph, chosen virgin and servant, pray for us! St. Joseph, white martyr of purity, fidelity, offering everything for your wife and child, pray for us!